"When the Undying Mind is threatened, its ancient creators step through time portals to defend it, ensuring that it will continue to thrive, until the Vex once again control the Black Garden." 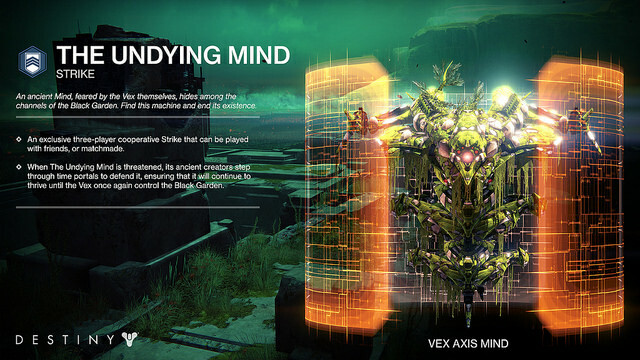 The Undying Mind is a Vex Hydra boss in the strike mission The Undying Mind. 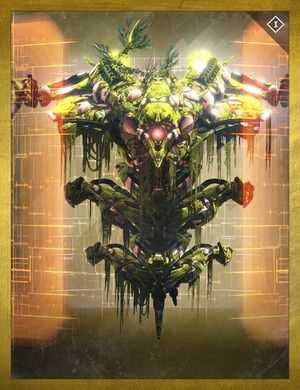 It is said to be an ancient Vex Mind, feared even by its fellow Vex, that seeks to revive the Black Heart and seal the Black Garden away from the Guardians once more. The Undying Mind was created by the Precursors and laid dormant in the Black Garden, until the destruction of the Black Heart. "Interesting, undying, huh? What do you suppose they meant by that." "I'll alert the Speaker. Let's find out." The Undying Mind is a unique Hydra in that it has three shields instead of one. When it first spawns, the passage which the player came from will be blocked, ensuring that there is no escape. It also has the ability to "detonate" when a Guardian gets too close, instantly killing them, and can summon endless waves of reinforcements, and while doing so, two vertical confluxes will send out blinding waves of energy to disorient Guardians. It is otherwise functionally identical to Hydras in that it is capable of blasting through a Guardian's shield very quickly with its Aeon Maul. While the Undying Mind's Aeon Maul blasts are orange-colored (Solar) the killcam clearly shows they are the same as ordinary Torch Hammers or Aeon Mauls (Void). This may be a developer oversight. Though the in-game description states that the Mind's creators will always protect it, there are no Precursors spotted throughout the strike.